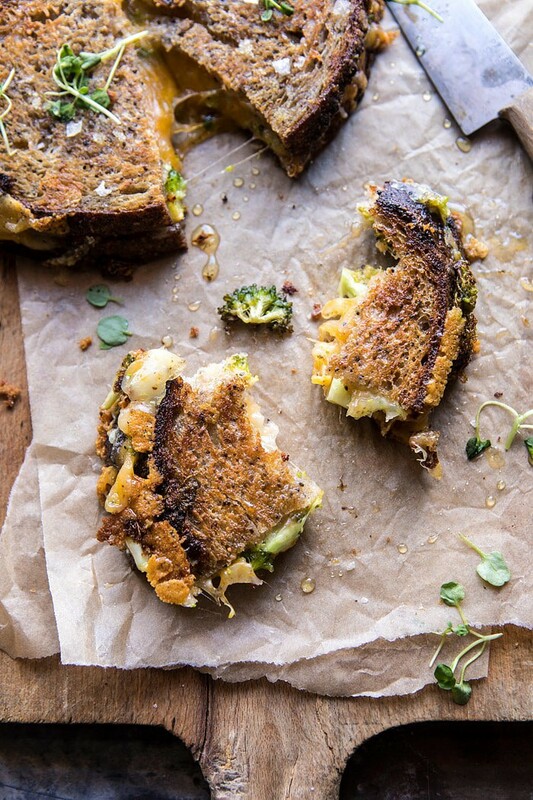 Welcoming the week with these Broccoli Cheddar Melts. Rroccoli cheddar melt from Half Baked Harvest on Vimeo. Because sometimes Monday’s need cheese and carbs. The good news is, there’s also a whole lot of broccoli happening in this melt, so we can basically just go ahead and call this health food. Right. Right. Either way you look at it, you need this sandwich to start your week off right. Just trust me on this. A few things. I’m going to be honest here, I’m not ready for Monday…at all. Is anyone else with me or what? My brain already feels a little tired after a weekend full of work, work, and more work. It was all good things, but I’m ready for another weekend, so there’s that. Plus this week is going to be PACKED, we have so much happening. My mom’s side of the family is visiting from Cleveland. They are coming in to watch Red at the Burton US Open in Vail. My parent’s house is going to be so full it’s insane, my mom has beds in every little corner. It’s like that book The Mitten up at their house, she’s always taking more in! We also have Christina, one of our amazing designers from Park and Oak, coming in to go over studio barn details. It’s busy, but also exciting. Loving it and feeling grateful for all the work and also all the family. My brothers are home, the girlfriends are here, the friends are here (and requesting this blackberry smash, which I made a pitcher of on Saturday along with these Pierogies), and it’s crazy and chaotic. Sounds about right for here. Also, I did not watch the Oscars last night, did you? Were they great? Was there drama? Who was best dressed? Do I need to procrastinate for thirty minutes and google the Oscars 2018?! Let me know. All the craziness has left me searching for those recipes that literally just take minutes to make and use ingredients that I already have on hand. 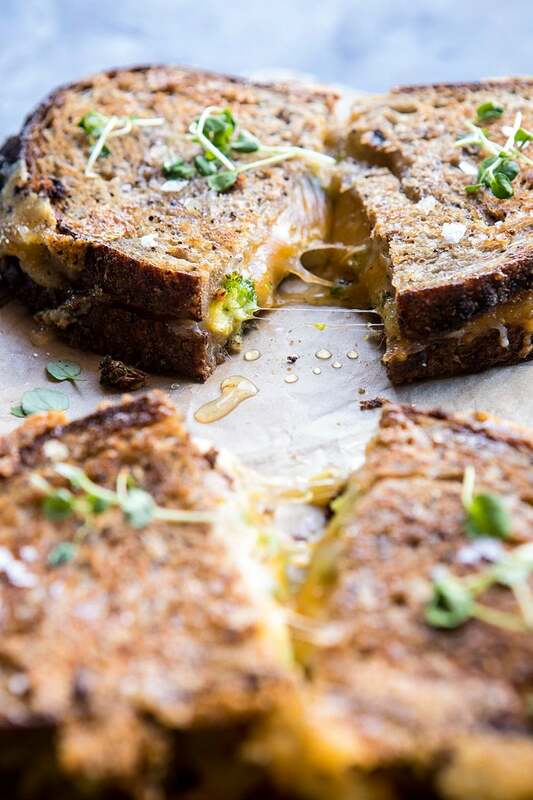 Enter these melts…or grilled cheese? I’m not really sure what the difference is, but I was feeling the word melt today, so I went with it. These broccoli cheddar melts are possibly one of the simplest meals, but then also the best. I mean, what could you not love about extra cheesy broccoli, sandwiched between two pieces of buttered bread? It’s pretty much perfect. Assuming you like broccoli, which I’ve personally loved since I was a kid, but then I was a weird kid. Here’s how this goes. You need really good bread that you personally love. That’s super important. I’m not sure if you can tell from the photos or not, but my bread was actually a really good seeded, whole grain loaf (just picked it up from Whole Foods, so nothing too fancy). It looks a little browned in the photos, but it’s actually PERFECT. Normally with grilled cheese type sandwiches, I’m all about a good white bread that’s softer, but this sandwich is different. I loved the heartier bread with the extra cheesy broccoli. 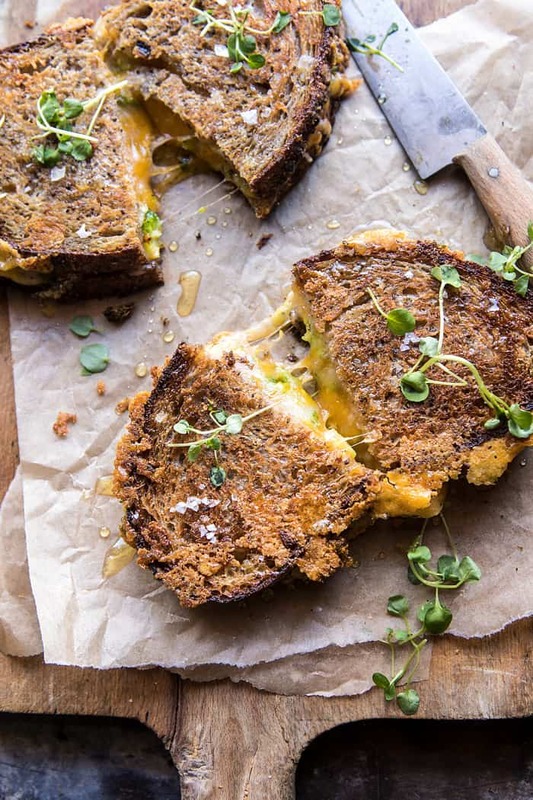 It gave the melt a really nice texture, and you know, made it a little healthier too. Again, whole grain bread, broccoli…health food. I seasoned the broccoli pretty simply, with fresh chives, garlic powder, salt, and crushed red pepper flakes, then layered it with sharp cheddar and provolone cheese. 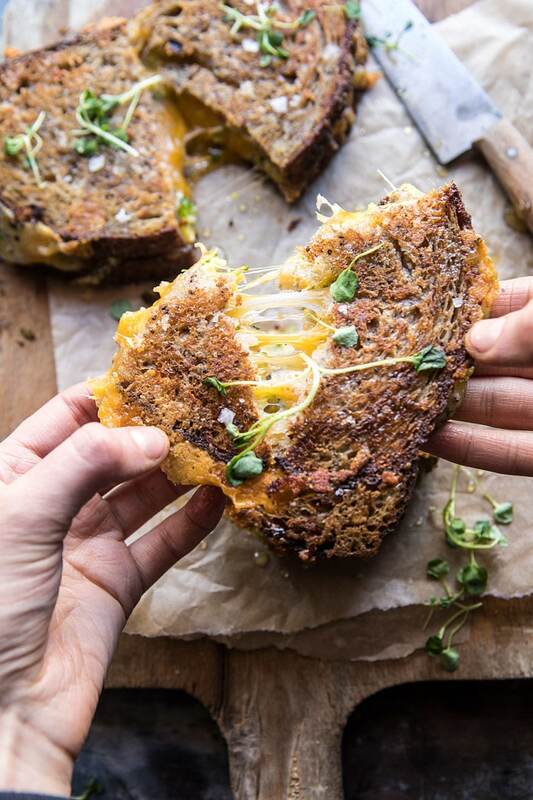 You can really use any combo of cheese you love, but broccoli and cheddar is it for me. It reminds me of Panera’s broccoli cheddar soup, which I adored as a kid. Put the sandwiches in a skillet with a little butter, and cook until the bread is golden and the cheese has melted. DONE. Lunch or dinner in under twenty minutes. Plus you have your whole grains, your greens, and even some protein from the cheese. Come one, I’d say it’s at least healthy…ish? Yup, going with it. Quite possibly one of the simplest meals, lunch or dinner in under twenty minutes. Plus you have your whole grains, your greens, and even some protein from the cheese, yum! 1. 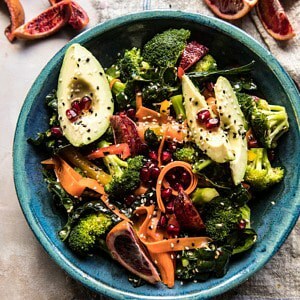 In a bowl, combine the broccoli, olive oil, chives, garlic powder, lemon zest, and a pinch each of salt and crushed red pepper flakes. 2. Spread the outside of each slice of bread with butter. 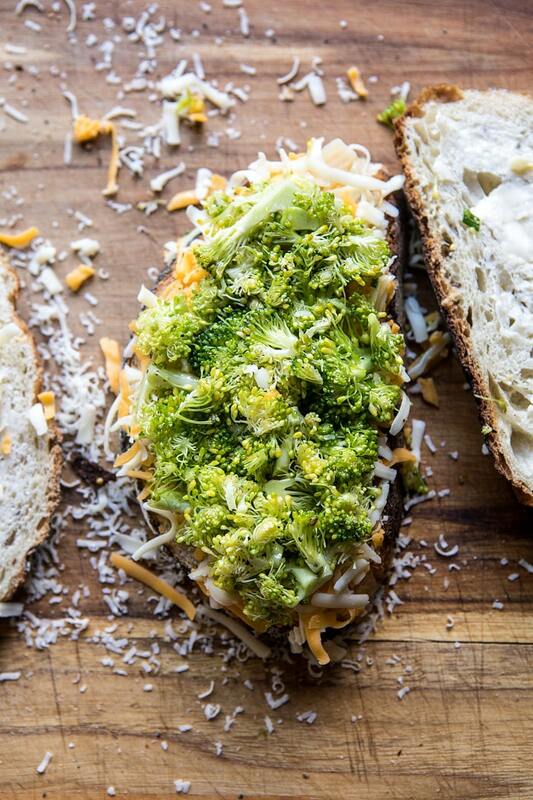 On the inside of half of the slices of bread, evenly layer the cheeses and broccoli, topping the broccoli layer with a slight sprinkle of cheese. Add the top piece of bread, buttered side facing up. 3. Heat a large skillet over medium heat and add a pat of butter. 4. Place the sandwiches, one at a time, into the skillet and cook until golden on each side, about 4-5 minutes per side. Serve topped with greens and honey, if desired. PS. these also fit for meatless Monday too. Cool. 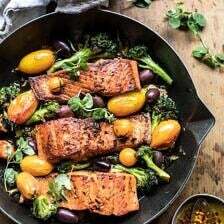 Sicilian Style Salmon with Garlic Broccoli and Tomatoes. Hey Tieghan! What a great idea. I always love a quick recipe because…baby. And I love that it’s packed with veggies (and CHEESE). I’ll sure give it a go! Thank you so much Anja! I hope you love this! bread and brocolli for me are a no no. I would totally eat this by replaceing the broccolli with turnip greens, though!! Yes!! I hope you love this Ruth! Yes! Just a little healthy touch! I hope you love this Kelsey! Thanks! What an amazing looking sandwich! I have a grandson who loved raw broccoli since he was a child. I would enjoy this sandwich and I’m positive he would too. I think the hearty bread was perfect for this recipe. Thank you so much Marisa! I hope you both love this! This sounds and looks so yummy. I would use rye bread and put in some caraway seed instead of crushed red pepper flakes. Great idea! I hope it turns out amazing for you Willy! I think I might lightly steam the broccoli before chopping. 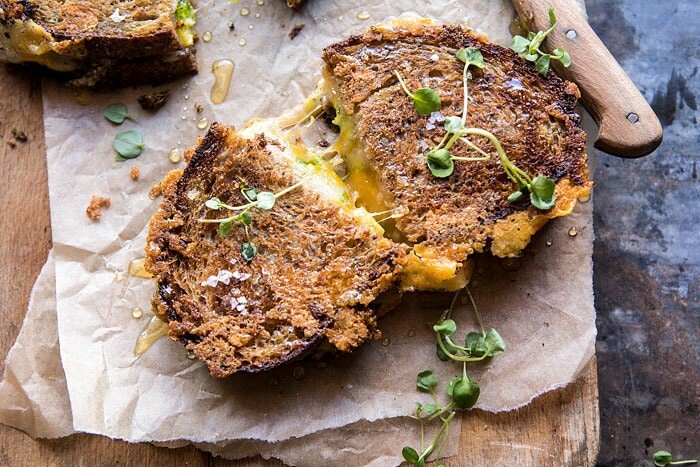 I wouldn’t like it crunchy with the melted cheese… Plus I hate when all the ingredients aren’t hot in a grilled cheese. But it is a yummy idea. Thank you Lee! I hope you love this if you try it! 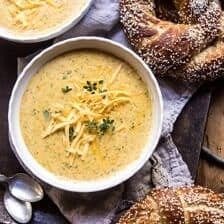 This is brilliant – my favorite soup is broccoli cheddar and I can’t believe I never thought of doing this before. Thanks again for your stunning photography – I am craving this right now! Wow, so this is one sandwich that neeeeeds to happen in my life!!! YES! I hope you love this Tori! Would ove to try your brownies. I am at 7300 ft.
Have you adjusted the tecipe for your altitude? Hi Cat! The brownie recipe should work fine at an altitude, no need to adjust. I hope it turns out amazing for you! Please let me know if you have any other questions! Perfect way to start the week Tieghan! I’m drooling over this sandwich! This reminds me of the Broccoli and Cheddar Chicken Cheesesteaks I order at a local pizza place. They are so good! Such a fantastic combination. Thank you for another wonderful recipe! Ooo yum! I hope you love these Cori! Thank you! This is exactly what I’m in the mood for today! Perfect! I hope you love these Naomi! Oh em gee this looks too good!!! yum! I actually have some broccoli that I need to use perfect to make these melts! Perfect!! I hope you love this Leigh Ann! Yum! These looks so good. I love broccoli! This is the perfect lunch! 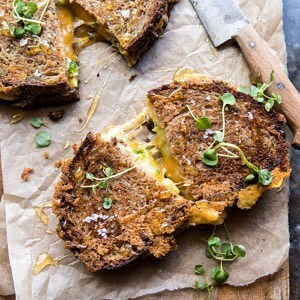 This broccoli cheddar melt looks so delicious! 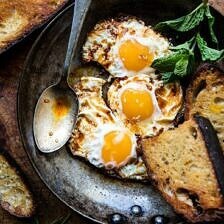 Will have to try this for lunch soon with gluten free bread! Let me know how it is! I hope you love it Lindsay! Thank you! Uhhm. These look so cheesy and delicious. Like just what I need today. Best melts ever, I need these in my life! Yes!! You totally do. I hope you love this! Had this last night with a side of tomato soup! It was JUST as good as the pictures — i’m hungry just thinking about it. Delicious sandwich and very filling. I like the touch of heat from the red pepper flakes, and I’m not really a spicy food lover. Served with a vinegar based coleslaw for a nice contrast. Thanks for a great recipe! 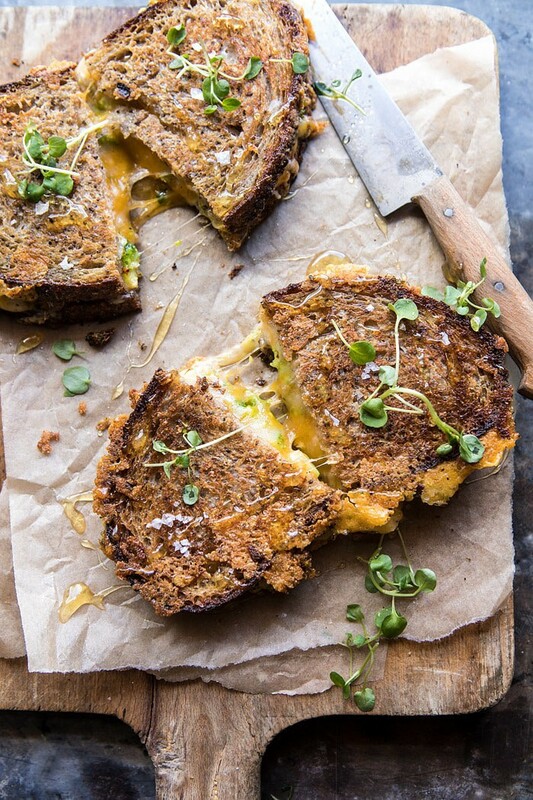 You have changed my grilled cheese game! This was amazingly delicious, I would never guess you cook raw broccoli right inside the grilled cheese but it was perfect. I am so glad you loved this Allison! Thank you so much! Hi! I love broccoli but I have a bunch of cauliflower on hand right now that I need to cook up – do you think that substitution would work? Thank you!